^ W Markowitz, RG Hall, L Essen, JVL Parry (1958). “Frequency of cesium in terms of ephemeris time”. Physical Review Letters 1: 105–107. doi:10.1103/PhysRevLett.1.105. http://www.leapsecond.com/history/1958-PhysRev-v1-n3-Markowitz-Hall-Essen-Parry.pdf. ^  LEAP SECONDS, USNO "Through the use of ancient observations of eclipses, it is possible to determine the average deceleration of the Earth to be roughly 1.4 milliseconds per day per century. " ^ アメリカ海軍天文台 (USNO) によるLEAP SECONDS の解説 「The Earth is constantly undergoing」から始まるパラグラフ及び次の「The length of the mean solar day has increased」から始まるパラグラフ "The length of the mean solar day has increased by roughly 2 milliseconds since it was exactly 86,400 seconds of atomic time about 1.88 centuries ago (i.e. the 188 year difference between 2008 and 1820). That is, the length of the mean solar day is at present about 86,400.002 seconds instead of exactly 86,400 seconds." ^ 「よく、閏秒が必要なのは、地球の自転が遅くなっているからだと言われている。本章や閏秒に関する他の文献を何の気なしに読めば、実際、地球は減速していて、時間がそれに合わせるために閏秒が必要になるのだと思うようになるかもしれない。しかしそうではない。1990年代の大半では、地球は速くなっていて（年ごとの比較だが）、この60年間でいちばん速くなっている。それでもこの27年間に22回の閏秒を置いてきた。となると、いったい閏秒はなぜ必要なのだろう。」、 トニー・ジョーンズ (2000). 原子時間を計るー300億分の1秒物語. 青土社. p. 154. ISBN 9784791759323. ^ Jones, Tony (2000). Splitting the Second - The Story of Atomic Time. IOP Publishing Ltd. ISBN 0750306408. ^  アメリカ海軍天文台によるLEAP SECONDS の解説 "Confusion sometimes arises over the misconception that the regular insertion of leap seconds every few years indicates that the Earth should stop rotating within a few millennia. The confusion arises because some mistake leap seconds for a measure of the rate at which the Earth is slowing. 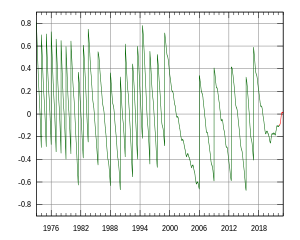 The 1 second increments are, however, indications of the accumulated difference in time between the two systems. (Also, it is important to note that the current difference in the length of day from 86,400 seconds is the accumulation over nearly two centuries, not just the previous year.) As an example, the situation is similar to what would happen if a person owned a watch that lost 2 seconds per day. If it were set to a perfect clock today, the watch would be found to be slow by 2 seconds tomorrow. At the end of a month, the watch will be roughly a minute in error (30 days of 2 second error accumulated each day). The person would then find it convenient to reset the watch by one minute to have the correct time again. This scenario is analogous to that encountered with the leap second. The difference is that instead of setting the clock that is running slow, we choose to set the clock that is keeping a uniform, precise time. The reason for this is that we can change the time on an atomic clock, while it is not possible to alter the Earth's rotational speed to match the atomic clocks! Currently the Earth runs slow at roughly 2 milliseconds per day. After 500 days, the difference between the Earth rotation time and the atomic time would be 1 second. Instead of allowing this to happen, a leap second is inserted to bring the two times closer together." ^ トニー・ジョーンズ (2000). 原子時間を計るー300億分の1秒物語. 青土社. p. 155-156 図5.9. ISBN 9784791759323. ^ Jones, Tony (2000). Splitting the Second - The Story of Atomic Time. IOP Publishing Ltd. p. 133. ISBN 0750306408. ^ 飯島重孝 1973, p. 60. ^ 古賀保喜 1975, p. 60.